The holidays have arrived! What better place to enjoy the season than Florida’s Gulf Coast where the holiday spirit is in full swing from Lakewood Ranch to Longboat Key and Boca Grande to Bradenton. We are bringing you a selection of our favorite events, attractions, and performances to bring in good cheer. 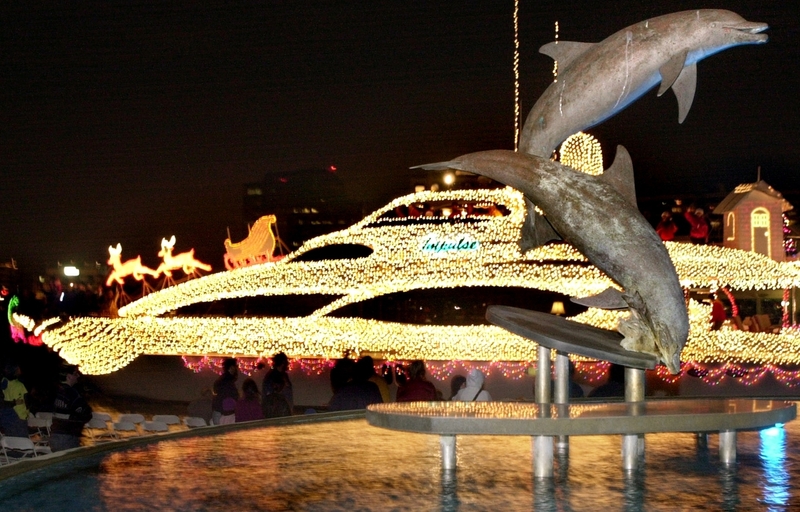 One of the highlights of the holiday season, head to downtown Sarasota to view the 31st annual boat parade. The best areas for viewing are Marina Jack, Bayfront Park, City Island, and Centennial Park. Celebrate the season along the Manatee River in Bradenton as boats trimmed with holiday decor light up the night. The best areas for viewing are the Green Bridge Pier, Riverhouse Reef & Grill, Riverwalk, and Pier 22. Experience the beauty of Historic Spanish Point in Osprey during the holiday season. Miniature white lights on majestic trees and in mangroves lends a magical holiday ambiance. Regular admission applies. Learn more at HistoricSpanishPoint.org. Enjoy daily viewing of tropical themed Christmas decorations and lights throughout Fishermen’s Village Mall, Resort and Marina in Punta Gorda. For more information visit Fishville.com. Visit the majesty of the Ringling Museum in the Museum Area at historic Ca’ d’Zan where the mansion is all decked out for the holidays including the 10′ tall tree that stands in the Grand Court. 5 p.m. – 8 p.m. Tickets $5 – $10. Free for members and free with “Art After Five” admission. Visit Ringling.org to purchase tickets. Meet Santa Claus, Dickens Carolers, and watch the lighting of the spectacular tree at Lakewood Ranch Main Street in Lakewood Ranch. Learn more at LakewoodRanch.com. Located on North Port Blvd in North Port, the one-mile parade’s theme changes each year. This year’s theme is “Candy Canes and Carols.” Begins at Greenwood and North Port Blvd. and moves north to Appomattox Blvd. Ring in the holiday season at the Annual Lighting of the Lighthouse in Boca Grande. Complimentary event serving wine and appetizers featuring live entertainment. Hosted at the Port Boca Grande Lighthouse & Museum, 880 Belcher Rd., Boca Grande, FL. Get a glimpse of Christmas long ago in Ellenton with decorations, live demonstrations, military re-enactments and more. Tours are free but donations accepted. Gamble Plantation Historic State Park, 3708 Patten Ave, Ellenton. For more information: 941-723-4536. Lights in Bloom in Sarasota at Selby Gardens offers visitors a stroll through magical gardens filled with beautifully lit flowers, butterflies, dragonflies and more. The tropical paradise includes miniature garden trains, Santa and his elves (before Christmas Eve), plus nightly live entertainment. For tickets, visit Selby.org. Experience the holidays island-style on Anna Maria Island from Bridge Street with Dickens Carolers, live entertainment, Santa and his sleigh, a hot chocolate bar, silent auction, artisan vendors and more. Celebrate the festival of lights at Lakewood Ranch Main Street hosted by Chabad of Bradenton. Highlights include design your own dreidel, doughnut decorating, meet Judah Maccabee, hot latkes, live music and raffles. To learn more: LakewoodRanch.com. The Charlotte Chorale presents holiday-themed choral music with over 65 voices at the Charlotte Performing Arts Center in Port Charlotte. For more information, visit: Charlottechorale.com. The Lemon Bay Playhouse in Englewood presents “Bob’s Your Elf”, a comedy by Norm Foster about an elf who must help out a small town with their Christmas pageant. For more details, visit: LemonBayPlayouse.com. Add an electric spark to your holiday season with Too Hot to Handel – the gospel version of Handel’s classic, Messiah. Presented by Gloria Musicae in collaboration with the Westcoast Black Theatre Troupe and live orchestral music, head to the Sarasota Opera House for a take on Handel’s Messiah unlike you’ve ever heard! For tickets, visit: GloridaMusicae.org. Delight in Carols and Classics at the Powel Crosley Estate in Bradenton. Take a tour of the 1920’s historic mansion set along the bayfront and enjoy carols and classic stories like “A Christmas Carol” and “Hershel and the Hanukkah Goblins”. For more information, visit BradentonGulfCoastIslands.com and watch our Saunders in 60 Holiday Special filmed at this annual event. The Sarasota Ballet presents the premiere of a masterful full-length work performed to live music from the Sarasota Orchestra. A ballet in three parts, enjoy a history of classical dance in France, Russia and America with music from Faure, Stravinsky, and Tchaikovsky. Purchase tickets at SarasotaBallet.org. The Sarasota Ballet – George Balanchine’s Jewels from The Sarasota Ballet on Vimeo. Venice Theatre in Venice presents “A Christmas Carol”, a musical version of Dickens’ classic tale following Ebenezer Scrooge. For tickets and more information, visit VeniceStage.com. What holiday season wouldn’t be complete without the Nutcracker? Enchant the whole family with larger-than-life magical props, a 60-foot growing Christmas tree and spectacular Russian-made costumes and sets. Head to VanWezel.org for details. It’s not too late to plan your holiday vacation in Sarasota, visit MichaelSaunders.com/rentals for a look at vacation rentals. What are your favorite holiday-themed events in Sarasota, Manatee, and Charlotte County? Are there any events we missed? Comment below to add to the conversation.